The Fargo Public Library will soon roll out its Book Bike to the community. The Book Bike can bring books and other materials, along with information about the Fargo Public Library, out into the community on sidewalks, at parks and at community events throughout Fargo. 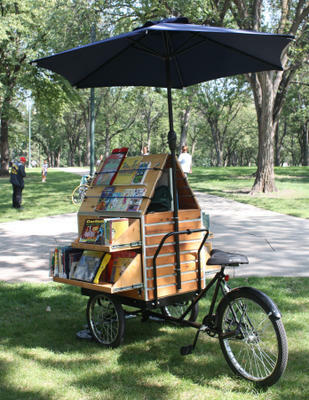 Equipped with a mobile hotspot and a tablet, the Book Bike acts as a mini library branch for library staff to reach residents of Fargo who might not have access to the library. With the Book Bike, library staff can create new cards, check out materials and make sure people know about all of the resources and the variety of events going on at the library. The bike was built by Worksman Cycles and purchased through Great Northern Bicycle Co. The custom box was designed and built by local architect/designer Scott Dahms of Dahms Design. The Book Bike will be out in the community at various events through early fall, weather permitting, including Saturday, Aug. 11, from 11 a.m. to 4 p.m. at Pride in the Park and Saturday, Aug. 18, from 10 a.m. to 2 p.m. at the Red River Market with additional dates scheduled in Sept. and Oct. The Book Bike will be on display Thursday, Aug. 9, from 11 a.m. to noon at the downtown Main Library.